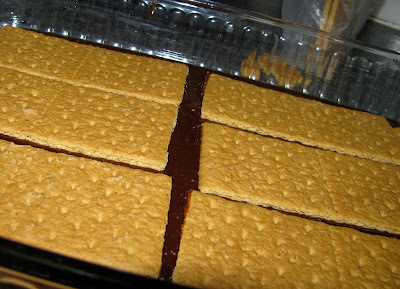 S'mores seem to the blogging theme of June, and as I don't want to be left out, I thought I would throw (one of) my recipe(s) into the mix. 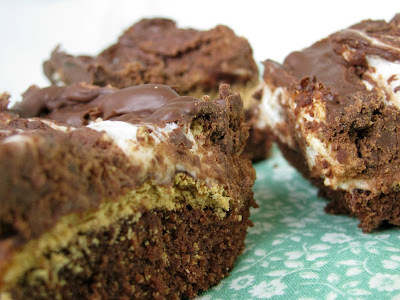 Though I realize I'm not alone in this proclamation, I'll say it anyway: I love s'mores. Growing up my brother and sisters and I had the only two things every child needs; a fire pit and a trampoline. In the winter our trampoline was at home in the corner of the backyard, resting a few feet below the deck in a special circular outfit specifically designed to house it... but, in the summer our trampoline was moved onto the deck unveiling a ring of stones. Nothing will ever be so special to me than a ring of stones. It is this that brings back the fondest childhood memories for me, sitting around the fire pit cooking hot dogs and spending time together as a family waiting for the embers to burn, patiently stacking graham crackers and chocolate. Thankfully, this is a tradition that has been passed on through three generations so far, serving as the cornerstone of any family event. 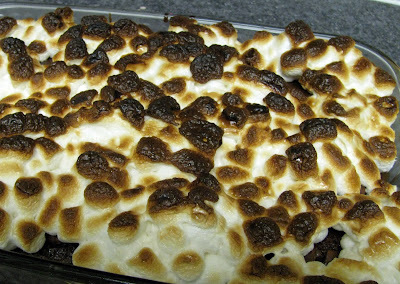 My favorite kitchen S'more concoction is actually Campfire Cookies, but those will have to wait until August's Recipe Swap. Speaking of... don't forget to submit your favorite summer salad recipes for June's Recipe Swap. 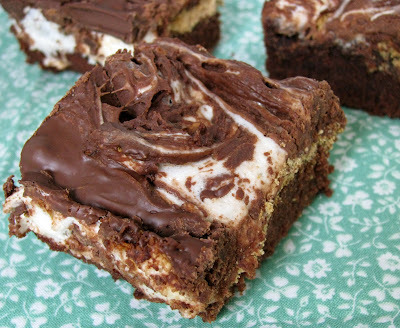 These chewy, ooey, gooey brownies are a crowd favorite, and so simple you'll wish they were more complicated so that you had an excuse to stay out of them. Oh my gosh is that YOU with your smore? Freakin' Adorable! 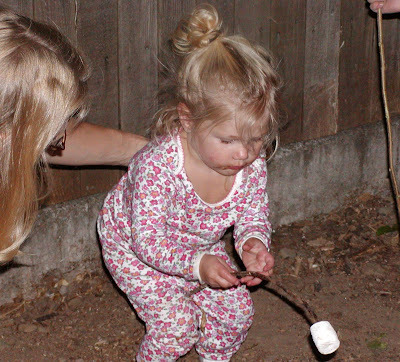 I wish that was me with my marshmallow, but it's actually my little niece who is now 8 years old! Isn't that the cutest picture ever? Man, those pictures are from way back, where did you find them? LOL! 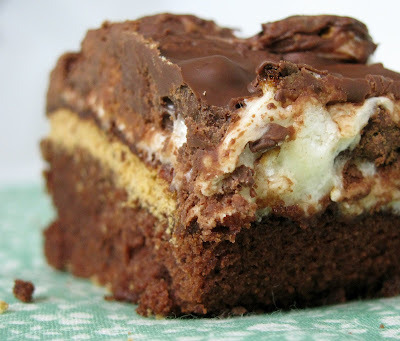 I love brownies and marshmellows I will have to add the graham crackers and try them! soooo gooood! I love the "old" photos and it is so wonderful to be able to pass these great ideas on to the new generation!!! I have bookmarked this, if you do not mind! I use a serrated knife to cut everything, which helps, but I think the biggest trick with these bad boys is marbling the chocolate, so that the marshmallow doesn't stand entirely alone. Hope that helps, and thanks for reading! Bookmark away! Oh..do I have campfire memories myself! 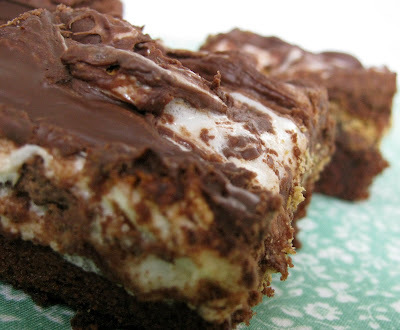 Those s'more bars look like they would definitely do the trick in bringing back those memories..but even tastier! Lovely job as always, Kitty! These look so great! I have notices the s'mores theme too. You have officially inspired me!